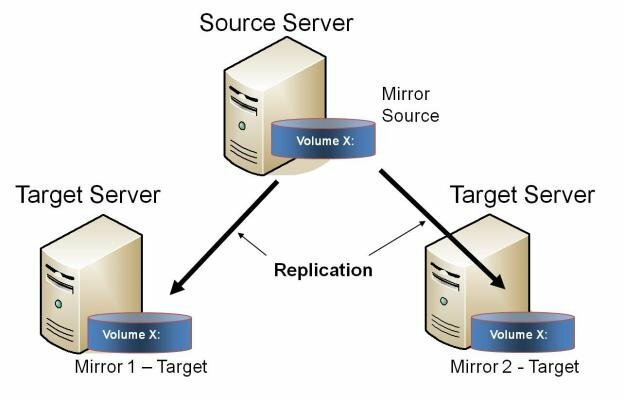 This configuration involves one primary (source) system replicating one (or more) volume(s) to two different target systems across the network. This is referred to as a multiple target configuration. Note that there are two mirrors that are completely independent of each other. The mirrors might be using different networks, they may have different compression or bandwidth throttle settings and they may be in completely different states (e.g. Mirror 1 — Mirroring, Mirror 2 — Resyncing). Replicate data to one target server that resides locally in the same site with the primary server and replicate another copy of the data to a remote site for disaster recovery purposes should something happen to the first site. To periodically replicate or “push” data to multiple target systems from a single source system.